The only thing between a Formula One driver’s head and a loose piece of debris in 2017 will be a helmet, reports Sky Sports. Today, the F1 Strategy Group voted against the introduction of a halo around the cockpit in 2017. Formula One may opt to do more testing on it to introduce the cockpit impact protection device in 2018, writes Sky Sports, but it is unclear as to whether the FIA will continue to push F1 to introduce a cockpit protection device on safety grounds next year. Perhaps this means they’ll reconsider the sleeker looking aeroscreen proposed by Red Bull, or more likely if the FIA isn’t pushing for it, they’ll drop the idea entirely. Sadly, F1's leadership doesn’t seem to care about drivers’ heads. Bernie Ecclestone was pushing hard against the idea of introducing the halo at today’s Strategy Group meeting, reports The Telegraph. 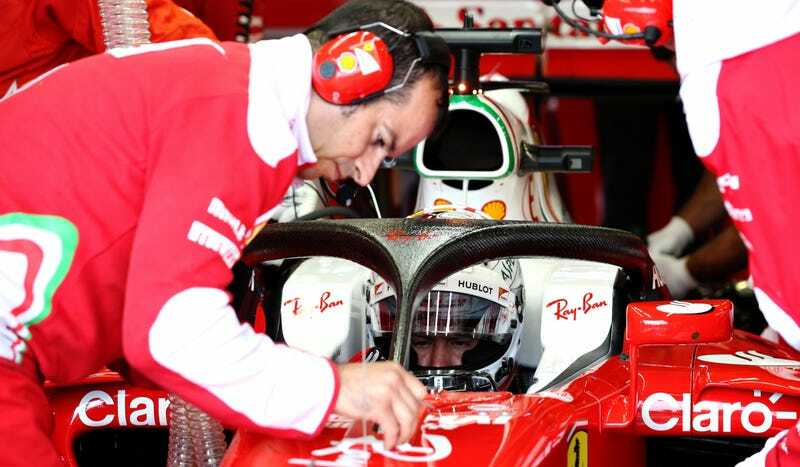 Ecclestone—despite all evidence to the contrary—argued that the halo would make the sport more dangerous, and that drivers opposed the idea. We don’t need it because it won’t do any good. It won’t save anybody. And it might be worse if a car tips over with it. It could cause more damage than it’s going to save. Most of the drivers don’t want to see it. They don’t want it. It’s a case of us and the teams will decide in the end. [Nico] Rosberg said in Hungary he had asked why it was a matter for the teams not the drivers – no formal vote of the drivers has ever been conducted – while [Jenson] Button was even more strident. They said there is a 17% improvement on life saving. We can’t ignore that. It’s a safety thing that we all have to accept. Facts and data are hard to ignore like that, unless you just don’t care. Today’s vote went to the don’t-cares. The Strategy Group consists of eighteen votes, six of which are split among the Red Bull, Ferrari, Force India, Mercedes, Williams and McLaren teams, six go to Jean Todt acting on behalf of the FIA, and six go to Bernie Ecclestone, who votes on behalf of Formula One Management. It remains a joke and a sham. While the Halo is currently the preferred option, as it provides the broadest solution to date, the consensus among the Strategy Group was that another year of development could result in an even more complete solution. Halo remains a strong option for introduction in 2018.